Cut-Off Tool vs Angle Grinder: Which is Best for Your Needs? You have probably come across a cut-off tool and angle grinder, but the difference between the two is constantly lingering on your mind. Do they both serve the same purpose? Are they budget-friendly? Which has a better performance compared to the other? These questions are valid and that is why we are here to clear the air on the difference between these two tools. First and foremost, what is an angle grinder? This is a versatile and long-lasting piece of equipment that is used for a range of things. It can be used for cutting, grinding, polishing and sharpening. On the other hand, a cut-off tool is a small, one-handed cutting blade that has been mounted perpendicularly to the drive shaft. It is best used for light metal cutting duties. In this article, cut-off tool vs angle grinder, we shall look into the various aspects of these equipment such as the price, performance and level of safety. This will help show the difference between the two and give you more comprehensive information to help you choose on the equipment that can help meet your needs. A cut-off tool is used mainly for cutting surfaces, while an angle grinder is a more versatile tool used not only for cutting, but also sharpening, polishing and grinding. This goes to show that an angle grinder has more uses and may be economical to use, especially if you are interested in more than just cutting of surfaces. The only thing you would need to do is purchase different discs or blades that are manufactured for the specific need that is intended by the craftsman. The two different tools are both operated in different ways. A cut-off tool is operated using one hand. This is easy to do since it is known to be quite light in weight. An angle grinder though, is operated using both hands because it requires one to maintain a certain level of control. More so, the added control of using both hands means that the cutting is kept steady while in use. In this way, it is more suited to heavy duty jobs. In addition, an angle grinder requires a lot of space when in use considering the cutting jobs that will be undertaken. Unlike, cut-off tools, angle grinders can be used in an array of surfaces such as metal, brick, concrete, porcelain tiles and ceramic tiles. One would only need to change the blades for the different surfaces. This goes to show you the level of versatility. Cut-off tools are mostly used for light metals only. As mentioned, a cut-off tool is a small, one-handed cutting blade mounted perpendicularly to the drive shaft. Alternatively, an angle grinder has its cutting heads at an angle to the drive shaft. This enables it to perform its heavy-duty functions quite efficiently. One would think that the angled head would be a hindrance for the craftsman to work the blade. However, despite this angled head, they can still go close enough to remove the small parts of a machine such as frozen bolts. Both a cut-off tool and an angle grinder come in the same types. They can be cordless, electrically corded or operated manually. 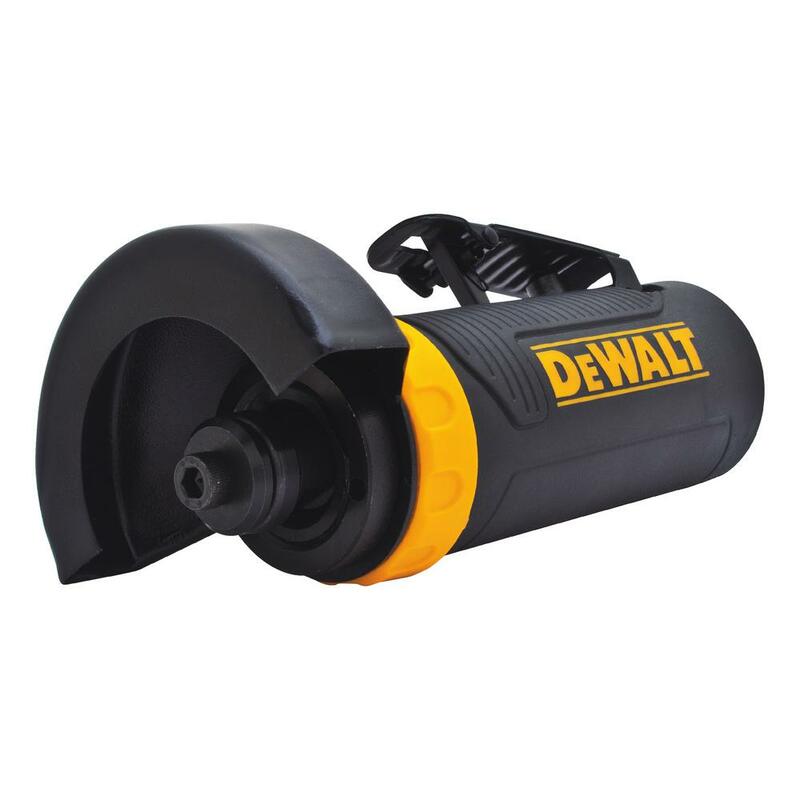 A cut-off tool has a light-duty motor that gets to around 1hp. (Horsepower)while an angle grinder has motors that range from 3-7hp. Unlike cut-off tools, an angle grinder is much bigger and powerful, hence why it can be used on several surfaces. Cut-off tools are best suited for the places that are hard to reach where a bigger tool such as the angle grinder cannot manage to fit. Additionally, they are great for cutting things close to being flush with a surface like a car frame or a piece of sheet metal. While a cutting tool is useful in reaching all the hard places, an angle grinder is no doubt the master of versatility. Not only can it be used on different surfaces by switching the blades, but it can also remove corrosion and direct from a shovel. Also, it can be used to sharpen lawnmower blades and improve other outdoor tools. A cut-off tool is cheaper than an angle grinder mainly because it has fewer uses. The blades are equally as affordable. Therefore, you do not need to break the bank to purchase it. As opposed to a cut-off tool, an angle grinder costs more than a cut-off tool. This is due to the added power and versatility it gives you. There is so much to do with an angle grinder from cutting, sharpening, polishing and grinding.In addition, you can change the blades from one with a smooth surface to one which is serrated depending on what you would like to do and achieve. The question one would battle with is whether you are willing to invest in purchasing one that gives a wider range of use, but is costly and the other which is cheaper but serves its main purpose. Depending on the tool that you purchase between the two, it is paramount that you maintain proper safety methods when using them. When in use, you can be sure of flying debris and other major or minor accidents. Using protective glasses, gloves, ear plugs, and dust masks are great ways in ensuring you protect yourself at all costs from an accident. So there you have it. A detailed view on a cut-off tool and an angle grinder. As has been seen, both tools are definitely good to use. The most important thing as a craftsman or anyone who would like to do a DIY job is to get to know if the main purpose of the tool aligns with what you would like to achieve. If you need one that is cheaper and used for light metal cutting duties, a cut-off tool will be best. Conversely, if you need a much more versatile tool and are willing to spend more on it, an angle grinder will be best suited for the job. Once you do this, it will be easy to make your purchase.